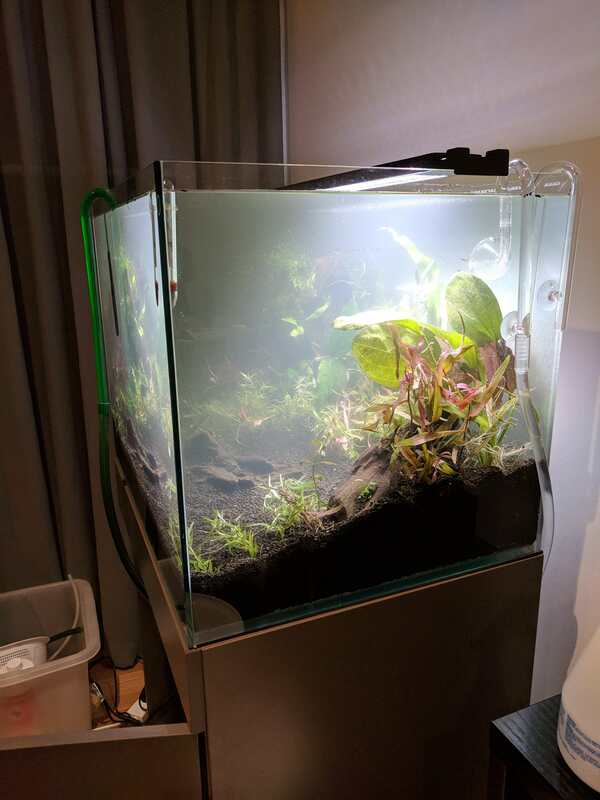 Placed $120 order with z-aquatics and will be getting some plants kindly donated by a fellow hobbyist, so big update coming soon. I have that type of egg crate and found that its only useful for fine adjustments given cost. 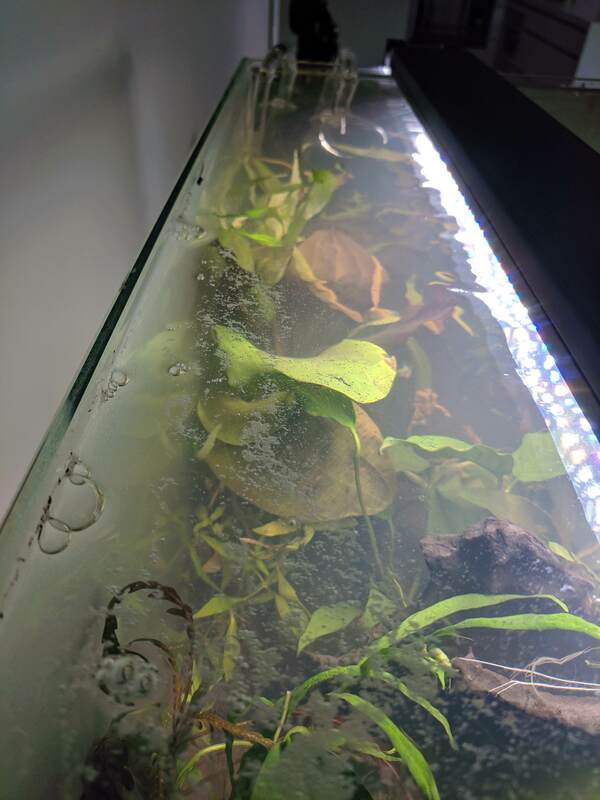 I only used it to dissipate and avoid sharp rocks on the bottom and back of my tank. After a massive trek to 3 bunnings, I finally have what I need for my DIY inline heater. I noticed the other threads don't have the part numbers so I've listed them below in the attached file. Anyone have advice on equipment placement? I'm thinking co2 diffuser close to the outlet the heater after. That means everything going into inline equipment has been filtered. 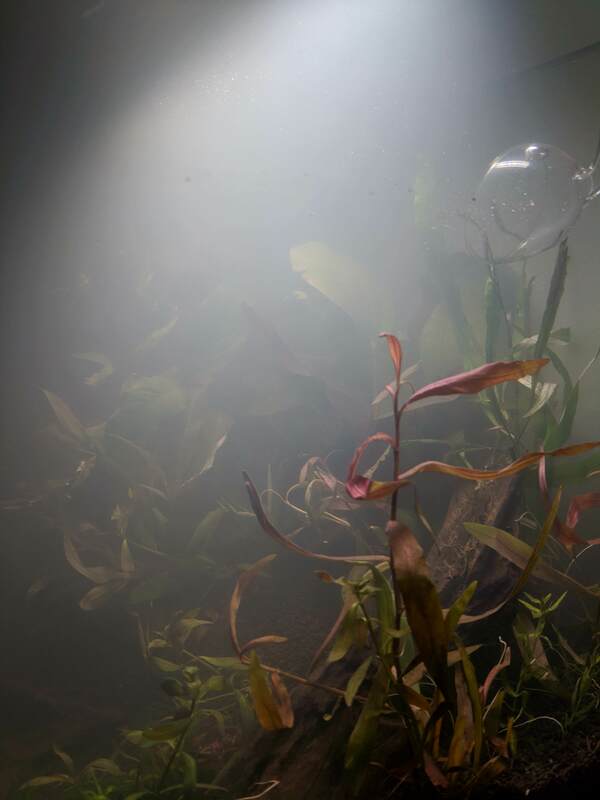 Co2 first means there's extra time for it to diffuse into the water as well. Thoughts? Generally the heater is put on the intake and CO2 on the output. You don't want any bubbles to get trapped in the heater enclosure that's all. Well, after planting yesterday I ripped up most of it and re-did it today. DIY heater is hooked up (not working at the moment because it's hot today in Melbourne) and CO2 is running. In the process of tuning co2 with a drop checker. 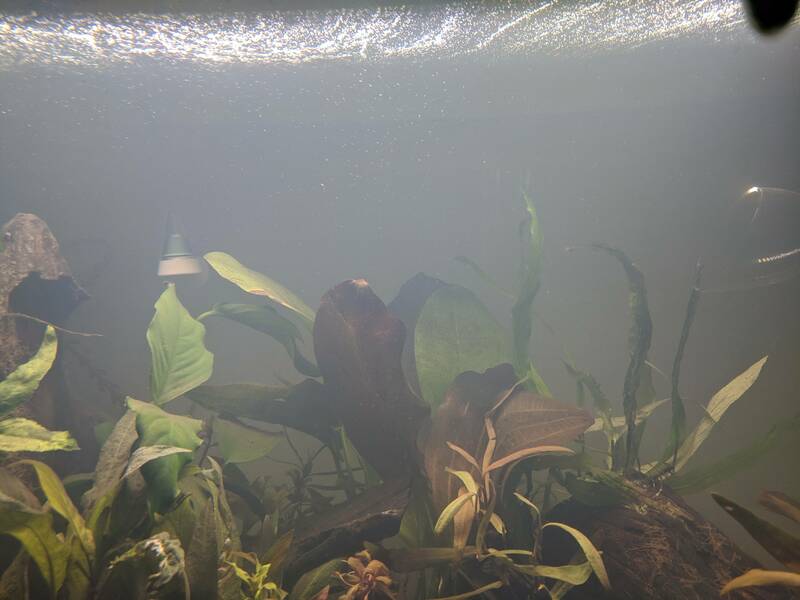 Water is cloudy and murky, a combination of the aquasoil and tannins but it will clear in time. 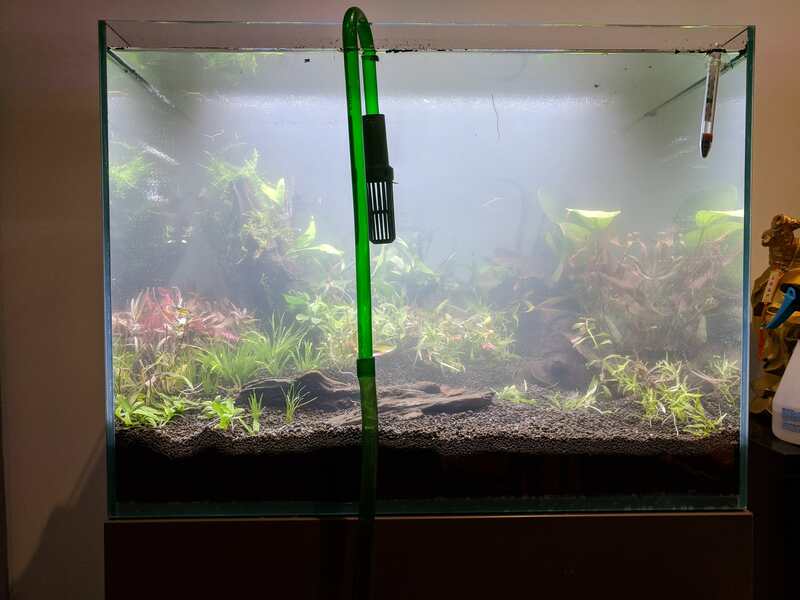 Takeaway from my first planted tank - you need good soil depth to really plant plants. The echinodorus rose was a headache to plant. 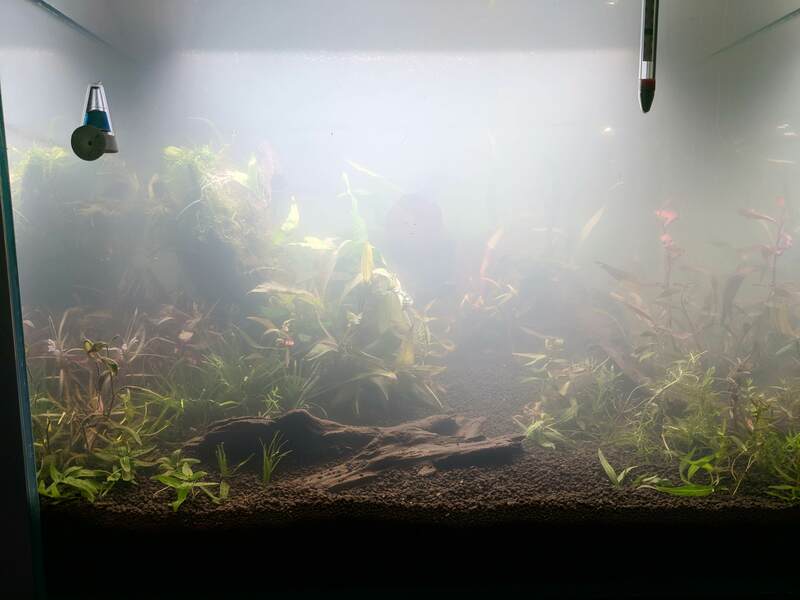 hey dude, toss the java moss! and send me postage moneys and ill send you xmas moss. 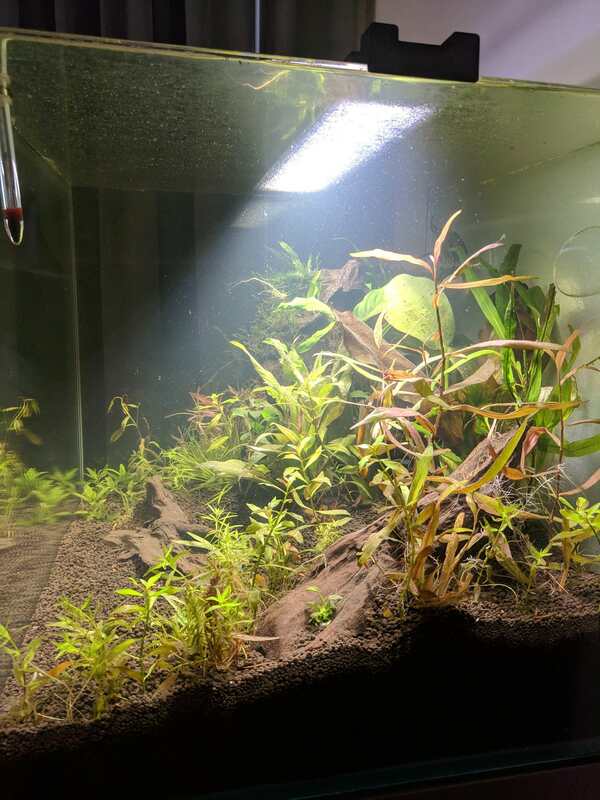 more than the equivalent amount of java moss that you have now. Agree with luke as Java doesnt grow any nicer with CO2. Will send a PM shortly. CO2 is blaring (maybe 4bps?) but drop checker still not changing colour. I know bps is only a rough guide but I'll have to keep tweaking. I can definitely see a few bubbles coming out of the lilly pipe and there are a lot of bubbles at the surface but this might also be protein scum. 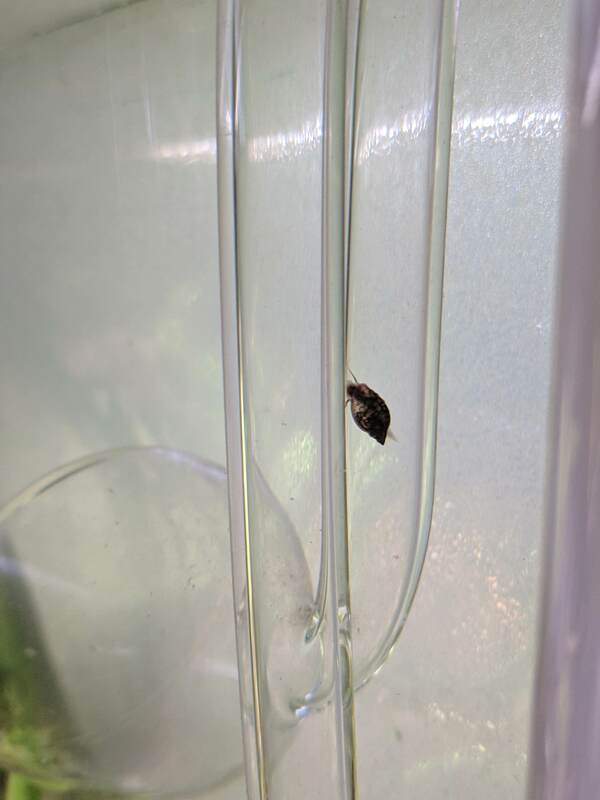 I'm using a fluval drop checker, will give it a bit longer to see if it changes colour. Looks like I'm in action. Drop checker has started to move between blue and yellow. 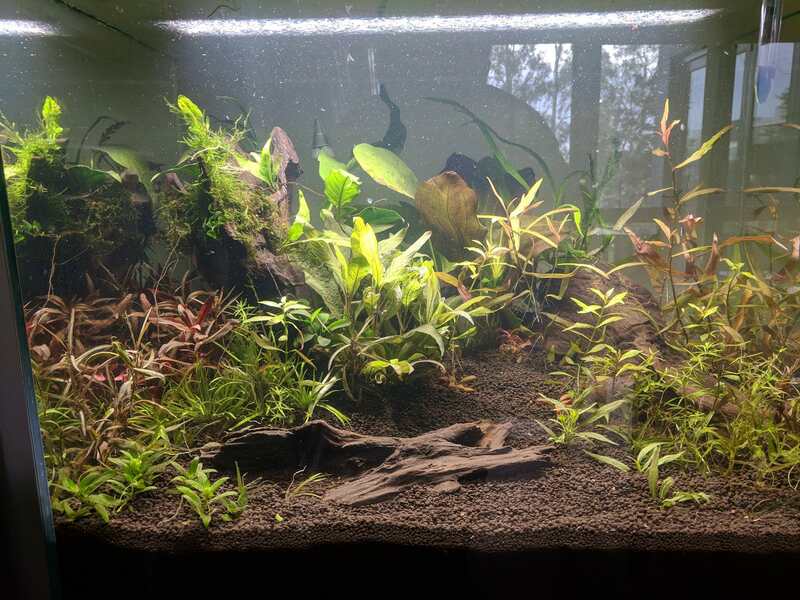 Day 8 of planted tank. Plants are starting to bounce back after planting, new leaves and shoots coming out on most plants. DIY heater seems to be working a treat, might have to crank up my co2 a tick as it's in the blue/green region on the check counter. 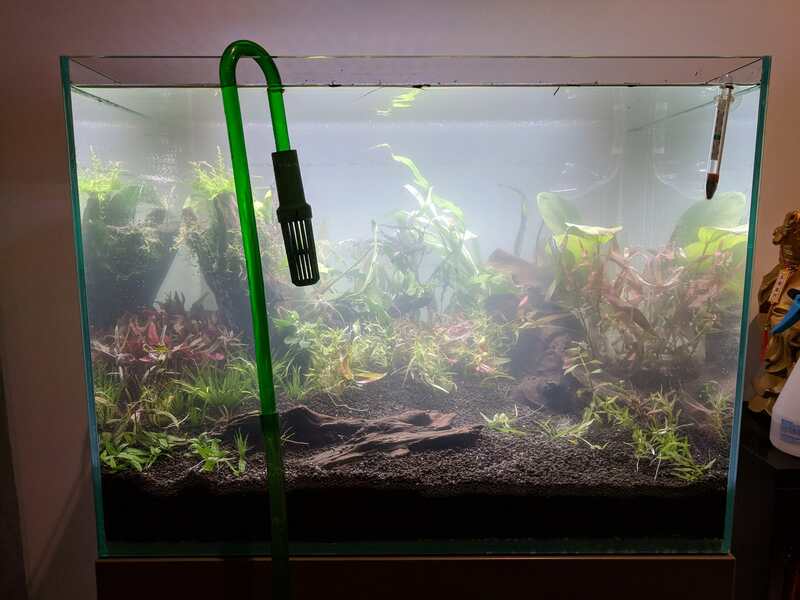 A fair bit of surface scum going on but I've ordered another set of lily pipes and will run an Eheim Classic 250 as a second filter. Haven't bothered taking ammonia/nitrite/nitrate readings at this stage. 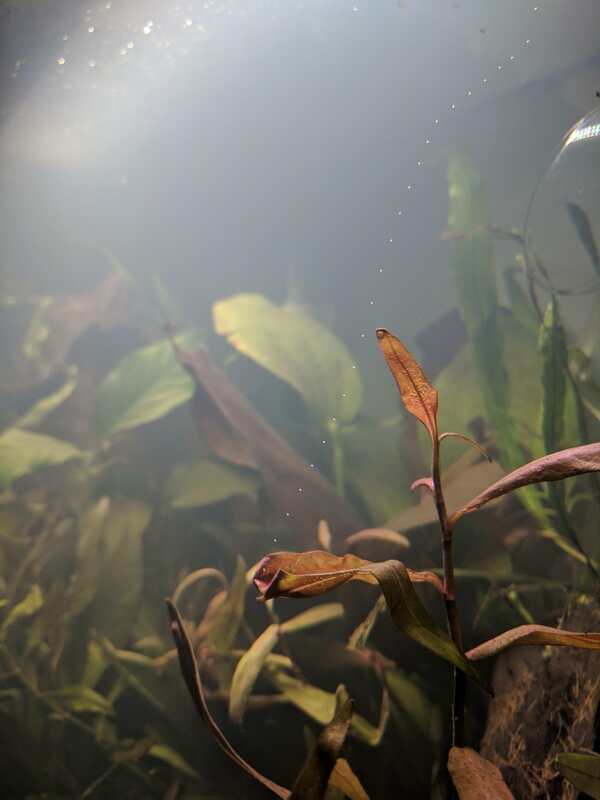 Tannins seems to have mostly cleared, a few more water changes should sort that out. 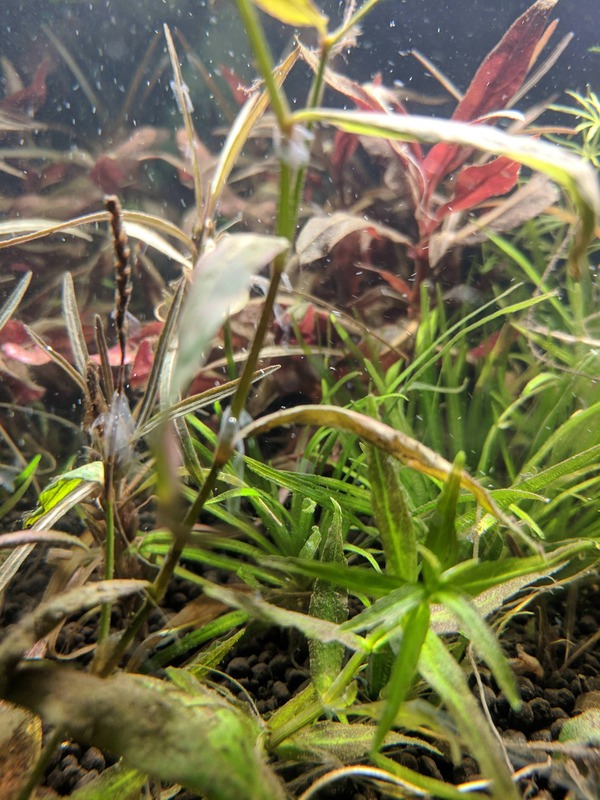 I've noticed some film like stuff clinging to plants, anyone have any ideas what it is? I suspect protein film. Also found a snail that must have hitched in the plants. Took him out and crushed it, hope there isn't anything else in there.